I was eating dinner last night when I heard it. It took a while for me to figure out what the sound was. A smoke detector battery. I thought I just changed all of them! The first ones lasted 3-4 years, why was one chirping now. Batteries last a long time when the detectors are wired into the house. I started changing batteries. This required a store run to buy more batteries. I went ahead and changed all four smoke detectors. Later I heard the chirping again. I didn't know there was one in the basement! This wasn't my responsibility when my husband was alive. This is the second time I have found a smoke detector that I wasn't aware of. Today I will be putting the old but still good batteries back in the first four detectors. I should be okay for a couple of years. The house was rewired at least four years ago, and three of the detectors were installed then. This last battery dates from that time. 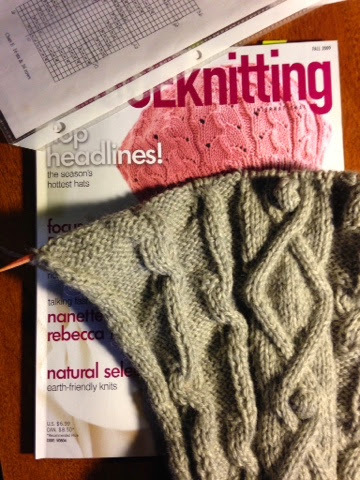 I'm plugging along on sleeve #2 for my sweater. 18 more rows until the underarm. I'll have to redesign the front soon. The magazine is hat research. I have a request for warm hats for grandkids for Christmas. February is hats thin month on Ravelry's Stash Down forum. I thought I'd get a head start on gifts. I have yarn pulled out for two hats. The first one is for charity. It's not warm enough for the grandkids, but it's washable, so the guild will get it. Today is cleaning day, as well as gym day, and work at the shop to catch up. Better get started. The word of the day was "Hope"